Almost entirely covered by the Tian Shan range, around 90% of Kyrgyz ter­rit­ory rests over 1500m above sea level. Nestled beneath smog-shrouded sum­mits of the Ala Too moun­tains, Bishkek acts as the cul­tur­al and polit­ic­al hub of Cent­ral Asia’s most open demo­cracy. With a rich nomad­ic cul­ture tangled with a Soviet his­tory, Kyrgyz­stan is in a peri­od of cul­tur­al trans­ition as it forms a new iden­tity going into the twenty-first cen­tury. 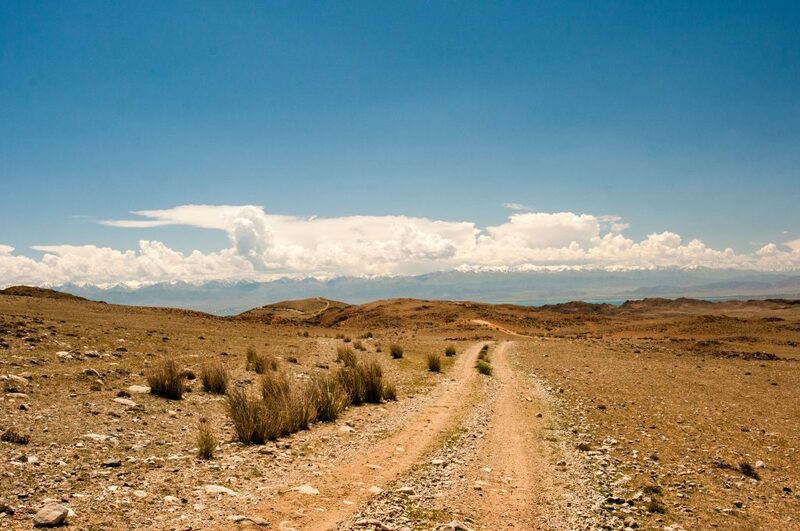 A track leads to Issyk-Kul, a Kyrgyz land­mark and endorheic lake, which sits beneath the Tian Shan moun­tain range. Each soci­ety needs its found­a­tion myth — where issues of what should have happened are pri­ot­ised over what prob­ably happened. This is no dif­fer­ent in Kyrgyz­stan: the forty rays stem­ming from the sun on the Kyrgyz flag rep­res­ent the forty tribes united under the epic hero Man­as, who (at some point between 1000AD and 1800AD), conquered the Uighur to the east and the Afghans to the south to define the land of the Kyrgyz. The 500,000 line Epic of Man­as, which out­lines this tale, has been updated and changed at vari­ous points (espe­cially dur­ing the early twen­ti­eth cen­tury), has been used as a tool to shape and mold Krygyz nation­al iden­tity through col­lect­ive memory. In 1876, the land that is now Kyrgyz­stan was integ­rated into the Rus­si­an empire. Come 1917, this war­ran­ted a dir­ect trans­ition into the USSR — although giv­en the remote nature of Kyrgyz­stan, Soviet con­trol didn’t reach Bishkek until 1919. Dur­ing this peri­od — agri­cul­ture was col­lect­iv­ised, edu­ca­tion was stand­ard­ised, and the ethno-cul­tur­al dynam­ics of Kyrgyz­stan fun­da­ment­ally changed; in 1989, only 22% of Bishkek was eht­nic­ally Kyrgyz. Bishkek’s pala­tial state-run bus ter­min­al lies mostly unused now that enter­pris­ing minicab oper­at­ors have out-priced inter­city buses. Fol­low­ing the implo­sion of the Soviet Uni­on, the former USSR region­al powers retained con­trol of gov­ernance — yet in 2005, the ’Tulip Revolu­tion’ saw the over­throw of the uncon­tested pres­id­ency, and the instilla­tion of a more com­pet­it­ive demo­cracy. Riots — fuelled by cor­rup­tion alleg­a­tions — led anoth­er pres­id­ent, Kur­man­bek Baki­yev, to flee the office. In 2017, Krygyz­stan saw Cent­ral Asia’s first suc­cess­ful com­pet­it­ive demo­crat­ic han­dover of power. Focal to Kyrgyz cul­ture is its nomad­ic his­tory. Tra­di­tion­al sports — typ­ic­ally equine based — are still pop­u­lar, with nation­al hol­i­days often entail­ing vari­ous horse­back sports, such as Tyin Emmei, where riders attempt to pick up a coin from the ground at full gal­lop. Fal­conry, both for sport and as a part of life — remain cent­ral to Kyrgyz cul­ture. Moreover, the yurt (an intric­ate nomad­ic tent), remains so integ­ral to Kyrgyz iden­tity that a bird’s eye view of a yurt is fea­tured on the centre of the post-inde­pend­ence flag; indeed, the Kygyz nomad­ic games team holds the world record for yurt assembly, in just over two hours (knock­ing almost 24 hours from the pre­vi­ous record). 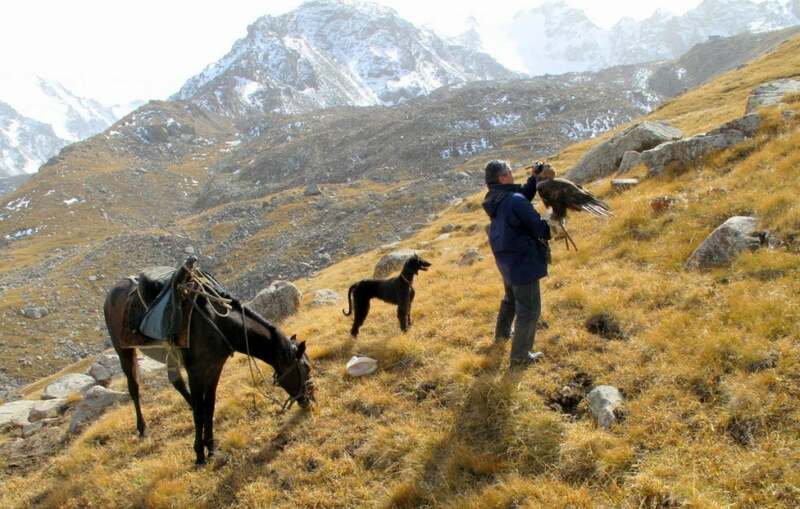 A hunter takes a mid­day break in the high­lands above Issyk-Kul with his horse, hound and eagle. Nowruz, the Per­sian new year, is cel­eb­rated each year between 21 and 23 March, with a series of music­al and culin­ary fest­iv­it­ies. 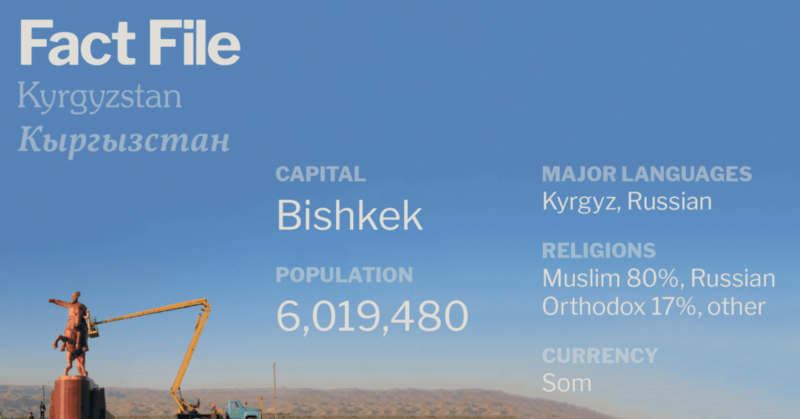 Typ­ic­al cent­ral Asi­an dishes, such as plov and sam­sas, are pop­u­lar through­out Kyrgyz­stan — with the south­ern city of Osh act­ing as an offi­cial culin­ary cap­it­al. Moreover, cer­tain Kyrgyz-spe­cif­ic meals, such as Naryn (some­thing to the effect of horse­meat with noodles) bear a not­able pres­ence. Of the Kyrgyz nation­al beers, Arpa, is sur­pris­ingly pop­u­lar amongst beer con­nois­seurs — not­ably for its hoppy pale ale char­ac­ter­ist­ics (rather than being a simple lar­ger). Cognac is also very pop­u­lar in Kyrgyz­stan, yet giv­en the expens­ive price of imports, Nash Cognac (‘our cognac’) is dis­tilled in Kyrgyz­stan. Nat­ur­ally, vodka retains a strong pres­ence as one of many Soviet hangovers. Some corners of Kyrgyz cul­ture remain some­what con­tro­ver­sial. Although not strictly ‘tra­di­tion­al’, bridal kid­nap­ping remains pre­val­ent through­out rur­al Kyrgyz­stan, yet giv­en its illeg­al­ity and grow­ing unpop­ular­ity, attempts have been made to erad­ic­ate the prac­tice. In 2017, Kyrgyz­stan became the first Cent­ral Asi­an coun­try to have a suc­cess­ful com­pet­it­ive elec­tion, with the rul­ing Social Demo­crat­ic Party can­did­ate won just over half of the pop­u­lar vote in the first round of elec­tions, mean­ing that there will be a peace­ful han­dover of power in Janu­ary of next year, a not­able step for a coun­try that has had two pop­u­lar revolu­tions since inde­pend­ence in 1991. Kyrgyz­stan form­ally oper­ates as demo­crat­ic uni­cam­er­al gov­ern­ment, how­ever, per­vas­ive Rus­si­an influ­ence, restric­tions to free speech (such as anti-gay rights advocacy laws) and cer­tain weak­nesses in the rule of law — cause Kyrgyz­stan to be con­sidered only a ‘partly free’ coun­try by Free­dom House, with an index score of 37 (com­pared to three in Uzbek­istan, or 78 in Seneg­al). Con­flicts between Uzbek and Kyrgyz eth­nic groups have often flared into viol­ence over recent years — occa­sion­ally rising to a level that threatens civil war. How­ever, these issues have been broadly quelled over recent years. Kyrgyz­stan remains the most open of cent­ral Asi­an coun­tries, with com­par­at­ively expans­ive journ­al­ist­ic freedoms, and visa-free travel to and from many oth­er coun­tries. How­ever, the state tax col­lec­tion base remains slim, thus squeez­ing pub­lic expendit­ure pos­sib­il­it­ies and leav­ing open a large inform­al eco­nomy. Kyrgyz­stan remains the second-poorest Cent­ral Asi­an nation, and des­pite com­par­at­ively high levels of equal­ity, per-cap­ita income remains low. 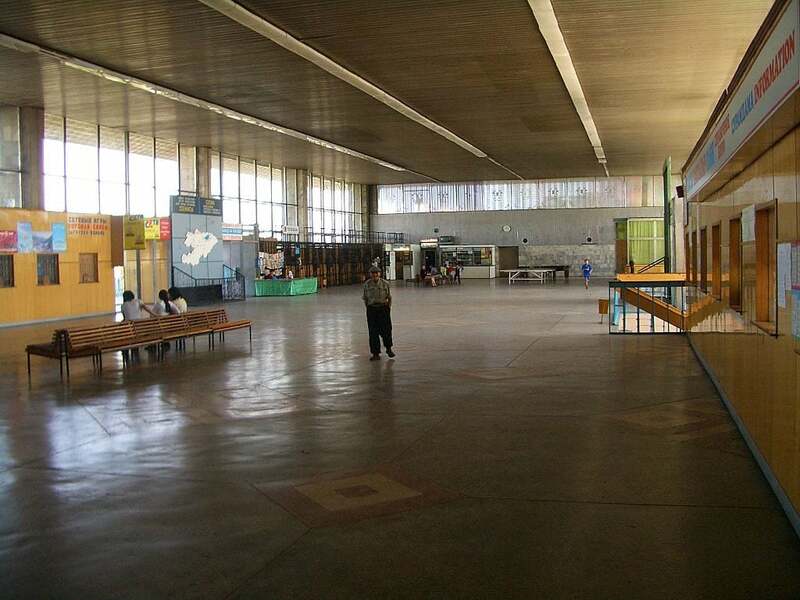 This is largely a con­sequence of hav­ing lost the Soviet Uni­on as a large export mar­ket. Moreover, it seems that most Kyrgyz people have not benefited from the trans­ition to a mar­ket eco­nomy, indeed, many have found their stand­ard of liv­ing to have fallen as pub­lic ser­vice qual­ity has declined. Non­ethe­less, prof­it­able Kyrgyz export indus­tries, such as a min­ing and pro­spect­ing, have allowed for the inflow of for­eign cur­rency, if not for­eign invest­ment. It remains to be seen wheth­er this cap­it­al inflow will gen­er­ate many jobs. 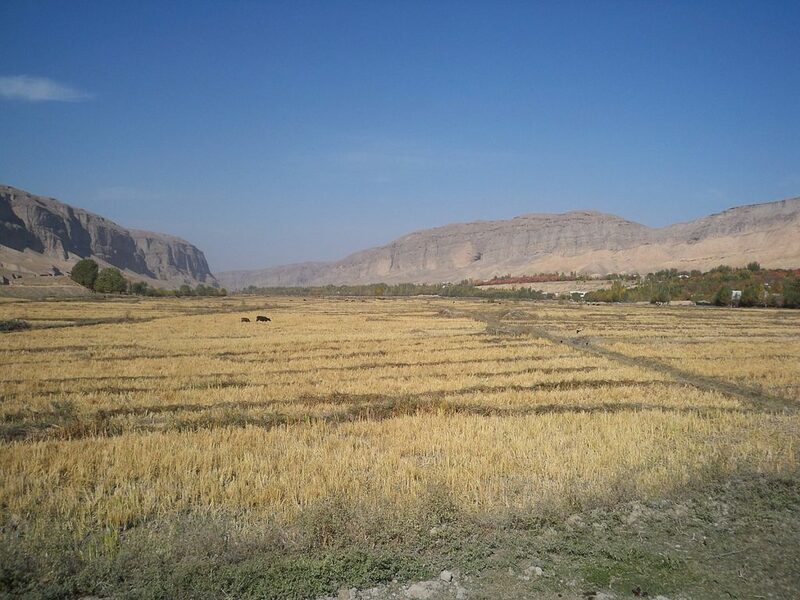 Rice fields near the vil­lage of Choy­un­chu, Leilek Dis­trict, Kyrgyz­stan. Agri­cul­ture remains a back­bone of the Kyrgyz eco­nomy.